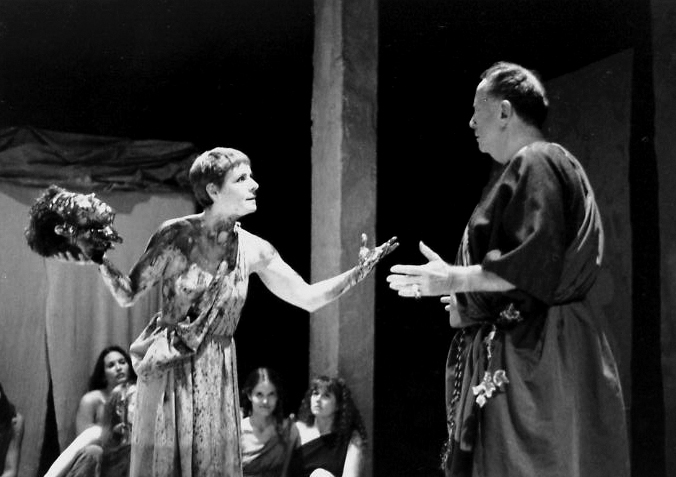 The Bacchae has a reputation as Euripides’ greatest play. It’s hard for me to say. 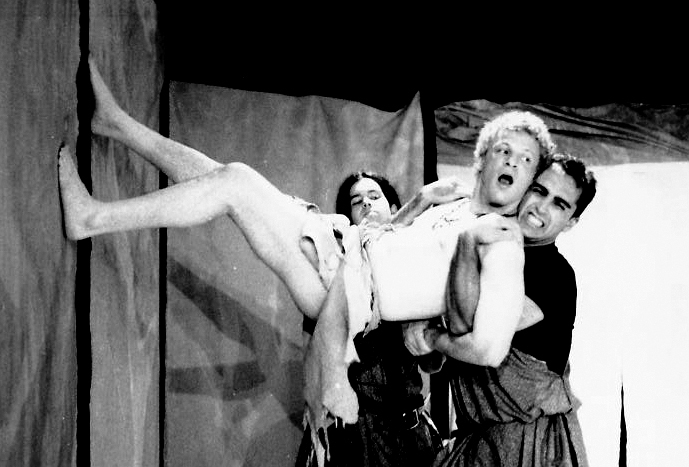 Even for a wildly eccentric and subversive playwright like Euripides, it is very odd. It was one of his very last plays, written quite late in life (in his 70s possibly), but even the contemporaneous Iphegenia at Aulis is nothing like it. It is concertedly archaic and much more soaked in myth and paganism than most of his other, more “human” dramas like Medea and The Trojan Women, which give voice to tremendous amounts of pain and suffering on behalf of life’s losers and victims. Thematically, however, it deals in more abstract universalities. Since abstract universalities are more prone to change over the millennia than concrete notions of pain and death, it is more difficult to grasp just exactly what is going on with the Dionysian cults and rituals that occur, even if you’re familiar with how they operated. Add to that Euripides’ inevitable perversions of received values and ideas, and the drama is baffling. It is quite unusual (even unique?) in surviving Greek drama in making a god not only a spectator and an agent of the action, but the actual protagonist. (Other tragedies with Dionysus as protagonist have been lost.) He is Dionysus returns to Thebes with a group of maenad followers, having returned from the east where he had been establishing his mysteries and rites. His Theban mother Semele was killed by his father Zeus on account of Hera’s jealousy (long story), but the rest of her family has been slandering her by saying she lied about Zeus being her lover, and that that is why Zeus killed her. Dionysius’ cousin Pentheus, son of Semele’s slandering sister Agave, is now king of Thebes and has banned worship of Dionysus. As expected, the maenads rip Pentheus to shreds, thinking he’s a wild animal—animal dismemberment was part of Bacchic rituals. Agave proudly brings back Pentheus’ head, thinking that she’s slaughtered a lion for a feast. Dionysus removes the spell from Agave so she can see what he has done to her own son, and Dionysus exiles the remainder of the family. Dionysus prophecies that Semele and Agave’s parents, Cadmus and Harmonia, will be turned into serpents. These grim antics are accompanied by joyless songs from the chorus of maenads, but much of the play is just Dionysus (disguised) and Pentheus onstage in dialogue, occasionally with a visiting messenger, until Dionysus sees Pentheus off to his doom and returns only in the guise of a god in the denouement to pronounce doom. The chorus, as well as some of the other characters, incessantly remind the audience that one does not anger a god and get away with it, ever. Yet Dionysus’ behavior is perplexing. He hardly seems like the good-times god of wine, and certainly not the buffoon of other myths. His Hermes-esque (Hermetic?) trickery and plotting seem calculated and malevolent. 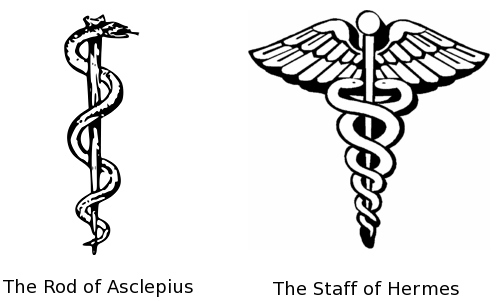 In a bit of mythological overlap, Cadmus and Harmonia’s transformation into serpents echoes the two serpents of Hermes’ symbol, the caduceus. To push that point a little further, Dionysus prophecies their fate simultaneously, emphasizing the pairing, whereas in the traditional account, Harmonia wishes herself to be transformed only after Cadmus transforms (by his own wish). Even more strangely, Dionysus lets himself be humiliated by Pentheus, who temporarily imprisons him and cuts off his hairlocks. (Dionysus will later cause Pentheus to grow girlish hair.) Yes, it’s a setup, but why? Dionysus is already hellbent on revenge and manipulating events, Pentheus has already refused to allow worship, and Pentheus has no need to indict himself further. None of this is enough to make you ultimately sympathize with Dionysus, who gets very nasty indeed. The sheer vigor of his revenge rhetoric as the play goes on is enough to make him unpalatable, like someone crushing ants for not staying out of his way. But in the facts, he is a victim, not of Pentheus but of other gods, particularly his wicked stepmother Hera. His obsession with revenge is not so different from that of Medea and Hecuba and Electra, Euripides’ vengeful women, but they were all more sympathetic than Dionysus. They weren’t gods. PENTHEUS: Bring my armor, someone! And you stop talking. DIONYSUS: Wait! Would you like to see their revels on the mountain? PENTHEUS: I would pay a great sum to see that sight. What happens is rather the beginning of a psychic invasion, the entry of the god into his victim, who was also in the old belief his vehicle. In the maddening of Pentheus, as in the maddening of Heracles, the poet shows us the supernatural attacking the victim’s personality at its weakest point—working upon and through nature, not against it. The god wins because he has an ally in the enemy’s camp: the persecutor is betrayed by what he would persecute—the Dionysiac longing in himself. These Dionysian rites then destroy Pentheus. He has inherited the sins of his ancestors without even the capacity to understand them clearly. Just before sending him off to his doom, Dionysus tells him he will return cradled in his mother’s arms, a happy regression to infancy. Here, though, Dionysus is an illegitimate child, even by the standards of Greek gods. Dionysius himself not accepted, not legitimate in Olympus, not even properly born to his mother before she died but incubated in Zeus’s thigh. He cannot take out his mourning and rage on other gods, but he can on the humans who ridicule his mother. In the myth, Hera motivates Semele’s sisters to slander Semele, but here they do it out of pure pettiness and spite, further stressing the emphasis on the human plane of events. Greek gods normally lash out at humans who are favored by other gods, but Dionysus is the only god in play here. And since the sin against him is that of questioning his very legitimacy, birth, and godhood, that he is defending himself against such accusations puts his status in doubt. And so Dionysus is a neglected and resentful child, less legitimate than the other gods (much in the way that Dionysiac cults were viewed suspiciously and as illegitimate), punishing his action figures because he has power over them. The story is two boys having tantrums, one of whom happens to be a god. The nature of Pentheus’ final sin is that of a man (or boy) thinking he is punishing another human, not a god. At that single point, Dionysus is humanly sympathetic, before the power shifts. I think that the need for Dionysus’ humiliation comes from theme and structure. Dionysus and Pentheus must be put on an equal level for a time, so that Dionysus is not only disguised as a human but is acting as one as well. (This also seems unprecedented in Greek literature, to the best of my knowledge.) That is to say, Dionysus can capture the audience’s sympathy only until he exerts his powers–his ability for revenge–at which point he is monstrous. He becomes a god, can only be recognized as a god, by becoming a monster. *As with Hamlet, we also lack crucial context as to predecessor plays around the Dionysus myth and exactly which parts of the myth Euripides altered, and consequently don’t know precisely what audiences of the time would have been surprised at.